The PennEast Pipeline Company is trying to build a 118-mile pipeline that will carry “fracked” gas from Marcellus Shale wells in north-central Pennsylvania, across the Delaware River and through the Highlands region into Hunterdon and Mercer Counties in New Jersey. If the project is approved, waterways that provide our drinking water will be threatened, and thousands of acres of open space that have been preserved from development will be scarred and damaged. Pipelines put our health at risk and pollute groundwater in many communities, plus they damage open spaces that are supposed to be set aside for our children and grandchildren. That’s why there is massive local opposition to PennEast! Landowners and towns have done everything they can to fight back: passing resolutions, and refusing buyouts. These communities need our help. If thousands of people across New Jersey raise their voices, we can stop this harmful and unneeded pipeline. PennEast’s application is before the Federal Energy Regulatory Commission (FERC). Tell FERC that we deserve a healthy environment, unspoiled open spaces, and energy that doesn’t put us at risk. 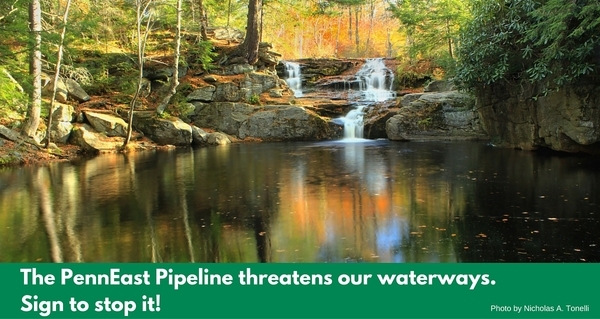 Sign the petition now to tell FERC to reject the PennEast Pipeline.